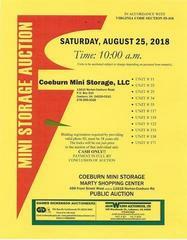 Abandoned contents of Coeburn Mini Storage, LLC, will be sold at AUCTION as per the Virginia Storage Act Section 55-418. Auction will begin at the storage facility behind Miners Exchange Bank, Coeburn, Virginia, Hwy 58 promptly at 10:00 A.M. At this time Units 11, 23, 25, 34, & 55 will be sold subject to payment by renter up and until 10:00 A.M. auction day. Successful bidders will be required to make payment on purchased units in full prior to moving across the street to sell units 117, 118, 122, 155, 158, 171. Units may be added or deleted as terms dictate. ALL UNITS MUST BE PAID FOR IN FULL BY THE CONCLUSION OF THE AUCTION ***CASH ONLY***. VIRGINIA RETAIL SALES & USE TAX APPLLIES UNLESS TAX EXEMPT FORM & NUMBER FILED WITH AUCTION COMPANY AT THE TIME OF PAYMENT. NO EXCEPTIONS. BIDDER REGISTRATION BEGINS AUCTION DAY AT 9:00 A.M. THE LOCK ON EACH INDIVIDUAL UNIT WILL BE CUT JUST PRIOR TO THE AUCTION OF THAT UNIT. ANNOUNCEMENTS WILL DICTATE AMOUNT OF TIME ALLOTED TO VIEW CONTENTS. PLEASE FURNISH YOUR OWN FLASHLIGHT. NO ONE WILL BE ALLOWED TO STEP INSIDE OR TOUCH/MOVE ANY OF THE CONTENTS IN THE UNIT PRIOR TO THE AUCTION. PAYMENT IN FULL BY CASH ONLY. VIRGINIA RETAIL SALES & USE TAX APPLIES UNLESS DEALER TAX EXEMPT FORM & NUMBER FURNISHED AT TIME OF PAYMENT. NO EXCEPTIONS! AUCTION WILL BEGIN WITH UNITS BEHIND MINERS EXCHANGE BANK. ALL UNITS PURCHASED AT AUCTION BEHIND MINERS EXCHANGE BANK MUST BE PAID FOR BEFORE MOVING TO THE FACILITY BEHIND HARDEES. (ACROSS THE ROAD). UNITS MAY BE ADDED OR DELETED AS THE TERMS DICTATE BY PAYMENT OF DELINQUENT RENT UP TO AUCTION DAY THRU 10:00 A.M. PLEASE CONTACT COEBURN MINI STORAGE, MARTY SHOPPING CENTER FOR UPDATED INFORMATION. 276-395-3326. AUCTION WILL BE CONDUCTED AS PER THE VIRGINIA STORAGE ACT. BIDDER REGISTRATION IS REQUIRED FOR BIDDING. EACH BIDDER WILL RECEIVE A BID NUMBER BY PROVIDING A PHOTO ID. MUST BE 18 YEARS OLD TO REGISTER. PROPERTY SELLS “AS IS” WITHOUT WARRANTY AS TO CONDITION, QUANTITY, QUALITY, SUITABILITY OF MERCHANTABILITY, WITH ANY AND FAULTS. BIDDERS ARE RESPONSIBILITY FOR THEIR OWN JUDGMENT ON CONTENTS OF EACH UNIT WITHOUT RECOURSE IN REDUCTION OF FINAL BID, OR REFUND OF PURCHASE PRICE, ALL SALES ARE FINAL!!! PROPERTY MUST BE PAID FOR IN FULL BY CONCLUSION OF THE AUCTION. PURCHASER IS RESPONSIBLE FOR REMOVAL OF ALL ITEMS WITHIN 48 HOURS OF AUCTION. THE AUCTION COMPANIES WILL NOT PROVIDE EQUIPMENT OR LABOR TO ASSIST IN REMOVAL OF ITEMS. BIDDERS ASSUME ALL RISK OF REMOVAL OF CONTENTS. NEITHER SELLER NOR AUCTION COMPANIES ARE RESPONSIBLE FOR BODILY INJURY OR DAMAGE FROM REMOVAL OF CONTENTS OR TO THE CONTENTS. ANNOUNCEMENTS MADE AUCTION DAY TAKE PRECEDENCE OVER ANY PRINTED OR VERBAL STATEMENTS MADE PRIOR TO AUCTION TIME. AUCTION COMPANIES REPRESENT THE SELLER. FOLLOW HIGHWAY 58 BYPASS(4-LANE) TO COEBURN, VIRGINIA. FACILITY IN TWO LOCATIONS AT MARTY SHOPPING CENTER. AUCTION WILL BEGIN PROMPTLY AT 10:00 A.M. BEHIND MINERS EXCHANGE BANK AND CONTINUE ACROSS THE ROAD BEHIND HARDEES. FOR UPDATED INFORMATION CONTACT COEBURN MINI STORAGE, LLC. 276-395-3326.